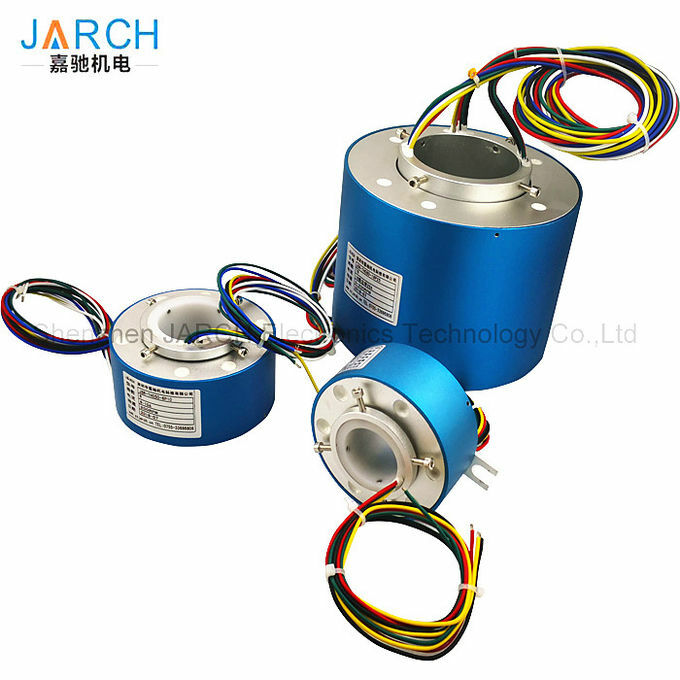 Slip rings are electromechanical devices that permit the transmission of power and/or electrical signals between stationary and rotating structures or equipment. These devices are used in electromechanical systems that require continuous rotation while transmitting power/signals and can improve performance, simplify operation, and eliminate potentially dangerous wires that might otherwise protrude from movable joints. Operationally, slip rings can be used on any sort of rotating electromechanical equipment to transfer power, control circuits, and/or analog/digital signals. They can commonly be found in everything from electrical generators to wind turbines to heliostats. 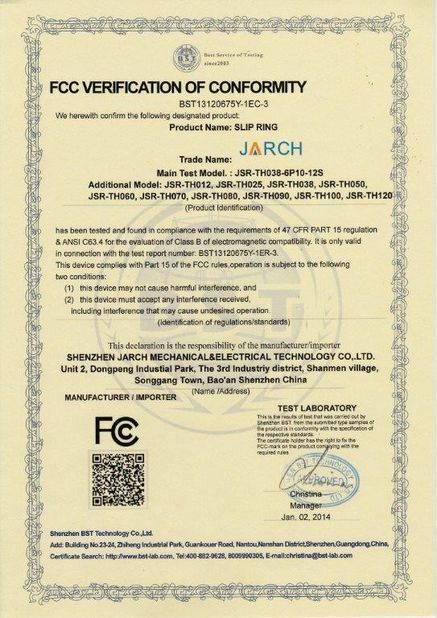 In simplified terms, a slip ring provides a way of making an electrical or data connection point through a rotating assembly. JARCH TH Series through bore slip rings are ideal for applications where signals and power need to be transferred, and a through-hole is required to pass either a shaft or other feed through. Designed for compact spaces, they are especially well-suited slip rings for use in wind turbines and generators. Also known as hollow shaft slip rings, our through bore slip rings use a modular design that allows for unprecedented flexibility with respect to package size and circuit count. We can provide numerous combinations of high current power circuits and low current signal circuits to meet your application requirements. Standard units can be supplied in any of ten standard sizes, with bore diameters from 3mm to 100mm. Large diameter through bore slip rings are available as custom solutions. TH Series hollow shaft slip rings use Orbex’s advanced channeled brush technology to greatly increase service life. This innovative design provides multiple contact points and low contact force, dramatically reducing wear in demanding applications. 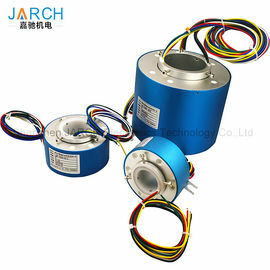 Whether you’re looking for a wind generator slip ring, slip rings for robotic manufacturing equipment, or a solution for any other challenging application, JARCH has what you need. 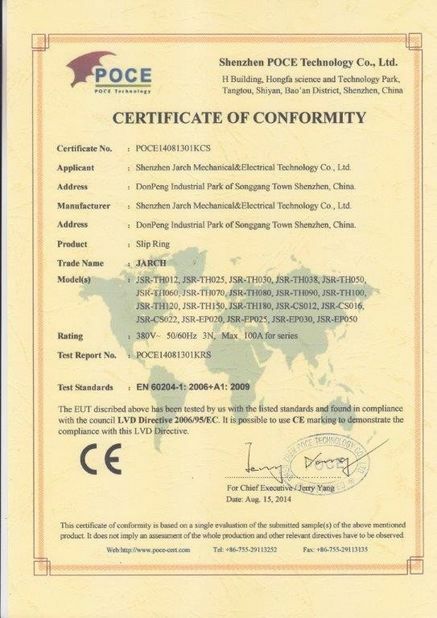 General specifications for our hollow shaft slip rings are listed below. Custom slip rings are also available—Contact us to discuss your custom requirements. Contact JARCH today for the through bore electric slip rings your application needs. Contact us for CAD files and solid models.